← Are Accordion Security Gates A Good Investment? This Chicago store front model contains twice as much galvanized steel as our normal heavy duty gates, utilizing a mixture of vertical bars and conventional scissor style webbing to permit total coverage. Our gates are planned with a continuous frame on all sides for better-quality support, including both fixed, or folding top and bottom tracks. Our Store front security gates come standard with a completely galvanized, weather and rust resistant finish and each gate is custom built to correctly fit our customer’s required space to secure, while providing safety and security that can fit into any budget. 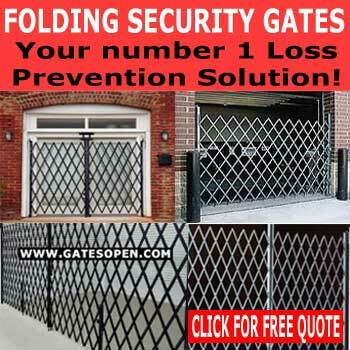 We have over 1000 folding security gates in stock and ready to ship.